Desktop Dungeon is a funky, puzzle rpg. It’s loosely based on Rogue-like dungeon crawl videogames, though each dungeon is about 10-20 minutes to play through. The game is simple in concept: your goal is to beat the boss of the dungeon – and each dungeon is randomly generated and one screen in size. I call it a puzzle rpg because the game moves so very far away from what you expect in rpgs, and especially Rogue-like games. There are no traps. The monsters do not move, do not chase you around, and do not initiate combat- you can think of them more like obstacles. You also can see their stats at anytime, and quickly do the math in your head if you can take them out or not – there’s no randomization in combat. There’s really no excuse to die in this game, it’s not about survival, it’s about winning. The question changes from “Can I win this fight?” to “In what order should I do things, to conserve resources, level up, and take on the boss?”. There is no natural healing- you only regain HP or MP through potions OR finding unexplored parts of the dungeon. Since the map is only one screen large, you find yourself quickly having to decide between hunting for items or trying to find low level monsters to build up with, vs. conserving those unexplored areas for extra healing and magic. Special abilities are found by “Skill Glyphs” – basically magic items you can pick up. Most characters can only hold 3, and they do a variety of useful things- give damage boosts, count your damage before the enemy’s in a fight, destroy walls in the dungeon, teleport an enemy to somewhere else, etc. You can also, instead, choose to convert skill glyphs into a bonus of some type- attack damage, extra MP, etc. A major part of the game is figuring out which glyphs are going to be helpful for your character given their class, and the monsters you’re facing, and which ones you want to skim off into stat bumps. If you trade them in early, the stat bumps let you take on monsters earlier in the game, if you trade them in later, you get bigger stat bumps. Like solitaire, you can find yourself in no-win situations. What carries over, character to character, is gold. So you can choose to just turn any particular round into a gold hunt and then click the “retire” button and try again. Each time you beat a dungeon, you unlock new character classes, new monsters, and new items which will randomly drop/generate in the game. Desktop Dungeon is brilliantly designed for replay value in this way. It’s a fun game that you’ll find yourself losing a lot of time to, as each round of play is short, and like potato chips, it’s hard to stop. It keeps the idea of a roguelike game that player skill is what drives play, while removing the random-death, learning through dying kind of play that makes things frustrating. 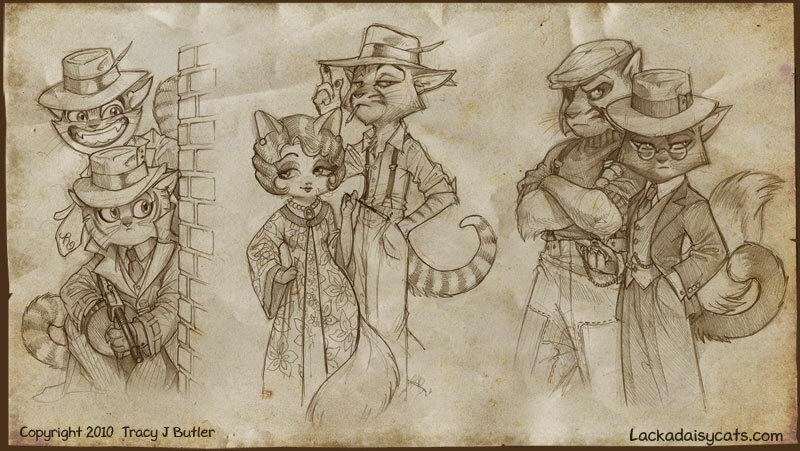 One of my favorite webcomics, Lackadaisy Cats, is in print. A speakeasy fallen on hard times, a widow trying to keep the operation running, a mix of savvy and crazy characters, and a lot of hijinks and fun action. I’m impressed with how well Butler conveys characters and setting in just a few pages, and when you get the chance to read it all together, how each page flows from one to the other, very easy and very smooth. It’s a fun comic, check it out, and if you dig it, go buy the print version! Although he’s talking about videogames, I think the design parallel to tabletop rpgs is pretty important- neither including aspects “just because that’s how it always has been done” nor including tons of rules trying to appeal to everyone – and in the end, losing the direction and focus of a game design. In terms of actual play, it also holds value, especially with the classic “20 minutes of fun in 4 hours” issue being many times an issue of pacing and GMs trying to delay things or failing to simply cut to the chase. That consistency is what allows a group who is into that type of fun, to reliably get that experience over and over, easily. 1. These things matter in the fiction; these other things do not. 2. These things matter mechanically; these other things do not. 4. These are the things that fit with the imaginary events and fiction; these other things do not. Notice that ALL of these can be answers when asked, “What’s your game about?” and, that all four of these have to be answered as part of your design in some fashion to completely answer that question. As a designer, these things need to be communicated in how to play the game. Some aspects can be left emergent, but if groups aren’t regularly engaging in the basic aspect of play, there is poor odds they’ll get to the emergent point of play. Designing a way to help a play group get all of that together, coherently and consistently, to provide a certain experience of play, is designing system, is designing your game to reliably produce a Creative Agenda in play. Specific procedures in play, how to coordinate between creative input by the group and utilizing stuff like points, tokens, minis, dice, and generally Cues, these all exist to establish boundaries about what is and isn’t important, what decisions can and can’t be made, and to set up economies of currency for players to strategize choices around –Fictional Positioning – ultimately working as signposts to the point of the game – The Fruitful Void. RPGirl zine is setting up for their next issue, and they’re looking for submissions. I snagged the first issue and was really impressed with how much info they had, and how real it was- it’s definitely for women by women without BS performative aspects (ala Marvel “Models” or “Part Time Sorceress” antics). Provided this goes at least a few years, I imagine we could see another form of play network grow out of this zine – much as the Forge or Story Games has produced their networks and mini conventions, we could see a lot of interesting developments both in design and play. You are currently browsing the Deeper in the Game blog archives for March, 2010.